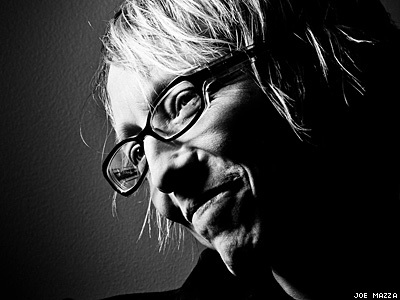 Lesbian writer, director, and filmmaker Wendy Jo Carlton has always been a working-class, rebellious girl — a theme that continues in her work today. Chicago-based filmmaker Wendy Jo Carlton has a way with women — on screen, at least. Carlton, an out lesbian, burst onto the independent film scene in 2009 with Hannah Free, a film adapted from Claudia Allen's play of the same title and starring the incomparable Sharon Gless in the title role. A romantic drama following the enduring love of two childhood friends who break free from the preconceptions and restraints of their small-town life, the film won numerous audience awards at LGBT film festivals around the country and cemented Carlton as a creative force to be reckoned with. Never one to rest on her laurels, by 2011, Carlton had written, directed, and released Jamie and Jessie Are Not Together, a romantic comedy navigating the perilous waters of friendship, romance, and relocation as only lesbian women can. The notoriously fickle film critic Roger Ebert said Jamie and Jessie "is a sweet, appealing musical comedy." Carlton's latest endeavor is a lesbian web series called Easy Abby, starring Second City alumna Lisa Cordileone, tracking the anxieties, assumptions, and passive aggressions of romance as seen through the eyes of Abby, a "chronic seducer with an anxiety order who's just trying to get by," according to a synopsis. The first three episodes are already available online, so you can get up to speed on Carlton's latest fictional foray. Between her daunting filming schedule for Easy Abby, Carlton found time to chat with The Advocate about rebellion, fostering new queer female filmmakers, and why so many of Carlton's stories take place in Chicago. The Advocate: It seems you have a good deal of experience translating stories into different media platforms: With Hannah Free initially starting as a play, then turning into a film, and then writing Jamie and Jessie Are Not Together as a feature film, do you feel like things ever get lost in the translation from one format to another? Wendy Jo Carlton: I wrote Jamie & Jessie in three months and we shot it in 17 days because Jax Jackson was moving to New York — just like her character Jamie was — so we had to move it or lose it! We had a great time making the movie because it's a romantic comedy, but it also has musical numbers. It's not a musical per se, it's a fun hybrid with the musical numbers meant to be raw confessional asides, as opposed to polished, show-off type of performance or duets. I've directed two feature films in the past few years. Hannah Free was adapted from Claudia Allen's play and it was her first film adaptation, so I helped her do that. I think we did a good job of telling Hannah's story visually and emotionally. And of course with Sharon Gless' performance as Hannah, the film really has an emotional impact on viewers. They are invested, and many folks end up bawling their eyes out, and to me that means it's successful as an engaging and resonant film. There will always be elements lost in translation from novel to screen or from theater to screen. For Hannah Free, Claudia's dialogue had to be cut down. It wasn't easy for her; she's been a playwright for 30 years! But my goal was to work within the indie budget we had, trim the dialogue down, and then interpret and translate her story into film. Hannah Free is very personal to so many people because it's about love being kept hidden. It's about love being demeaned by others, and for me, it's about a love affair between two women, yes, but [between]these two specific women. I discovered the more I locked into Hannah and Rachel as idiosyncratic, flawed, real people in the world, the more we end up believing them as a couple. And when we see them on the big screen, it's much harder to deny that love. The audience sees Hannah and Rachel as them, together. I wrote and directed Jamie and Jessie are Not Together, and it was written for the screen from the get-go. I also had the luxury of already casting the two lead actors (Jax Jackson and Jessica London-Shields), and so I had these fabulous muses who I really cared about, and they were also great collaborators in character development. We had very little money to work with (we raised $20,000 through a Kickstarter campaign plus a couple loans), and so when I was writing, I was already picturing locations and props we could have access to for free or cheap, or I just didn't write it in. Many of your projects take place in Chicago — is that a convenience, or do you feel that Chicago has something unique to share with LGBT viewers? It makes sense to shoot in Chicago because I've been building relationships and resources that help me manifest these projects. Chicago is more of a theater and improv city than an indie filmmaking city, but there is a lot of great talent here, and very smart, funny, motivated artists. Also, I've found the LGBT community and business owners in general seem more supportive here than in New York or Los Angeles, maybe because it's a well-rounded city not built around the media industry and folks aren't as jaded or as competitive. I'm a working-class girl, and I wasn't really expected to go to college, let alone end up making feature films filled with female and queer protagonists — that Roger Ebert ends up reviewing and liking! Working in Chicago helps me stay closer to that blue-collar sensibility: the understanding that things are not going to be handed to you, whether that's basic information about how to buy a house or start a business, or just having access to people in power. And the characters I tend to write about have a similar sort of experience, whether they are LGBTQ, female, or emotionally troubled, they are also marginalized, either by culture or by their own choice. I love the rebels! And sometimes being a rebel just means showing up, being loyal, dancing hard, or saying I love you. When I'm writing I'm not thinking about the bigger political picture, I'm thinking about the particular desires and flaws of the characters and how their flaws tend to get in the way of their desires. I love the human heart! I love the complexity and the magic of attraction, which is why most of what I write is romantic with a dark comedy pinch. When I stay close to the specific personal dynamics between two characters, it becomes more "believable" as a universal experience. Which is why, in Jamie and Jessie are Not Together, the two queer women are sloppily falling in and out of love with each other, but nowhere in the entire movie are the words lesbian, gay, queer, dyke, or coming out. I'm playing with that a bit differently with the Easy Abby web series though, because I'm interested in having more butch and trans characters onscreen. Sometimes casting is difficult because my priority is good acting, not trying to represent the full spectrum of queer aesthetics and identities and I’d love to have a wider range of queer "looks" in the show and that means more folks auditioning and me going out and scouting for that to happen. Tell me more about your media literacy program, Chicks Make Flicks. When did you found the program, and what does a typical day in the program look like? Chicks Make Flicks was created so that teenage women could have access to cameras and editing tools in a space without young men around. [Where] they feel freer to express themselves, and to get comfortable with technical stuff without co-ed social pressures, and sexist misconceptions about technology and who is "good at it." The program also integrates critical viewing skills around the representation (or lack thereof) of women and girls in movies and TV. We watch clips of popular shows and commercials, with and without the sound on, and discuss what we see and how that affects us all in an oppressive and inaccurate way — For men and boys too! I'm currently seeking funding to get the program up and running again, and to be able to bring it to smaller towns in the U.S. too. My dream is to travel in an RV and bring Chicks Make Flicks to a dozen places, and create a film that connects the girls from each different town, in addition to them making their own personal videos. On that note, what advice do you have for young lady-loving filmmakers looking to break into the field? My suggestion for newer filmmakers, regardless of gender, is to collaborate with like-minded artists and help each other get things done, while at the same time commit yourself to sitting down alone and writing. That's the best way to develop your ideas and characters, and to get to the bottom of what you care about. Those insights are what will keep you energized, because planning and completing films requires a lot of energy and determination. If you're an LGBTQ filmmaker and want to make new LGBTQ-specific content, there is certainly a demand for more fresh content. And with access to the whole planet via the interwebs, it's easier and cheaper than ever before to make that happen. How has the filmmaking industry changed with the advent of crowd-sourcing sites like Kickstarter? Has it put more power into smaller filmmaker’s hands? And is it actually a viable way to get a film funded? Last year Kickstarter campaigns raised more than $1 million for independent film projects. So yes, it's a viable place to get funding. But it still takes a village to make a feature film, so creating partnerships locally with folks who like you and what you're making is just as important. And so many artists are on the Kickstarter and IndieGoGo wagon now that it's difficult to raise the funds needed without significant support from larger networks that can help promote your campaign. It's still kind of about "who you know," but at least it helps indie queer films get off the ground, and that's the hardest part. What’s next for Abby in Easy Abby? Will we see her get a handle on her neuroses, perhaps as she finds herself in a fulfilling relationship (or two)? I have to say I'm a bit in love with Abby. She's a chronic seducer with an anxiety disorder. She's good in bed and has a knack for zoning in on what a woman wants in the moment, but she's a bit of a grump outside of the zone, and she's not so good at love or longevity. Lisa Cordileone is just fabulous in this role and we work together developing the character. Each episode is five to six minutes long, and somewhere in the middle of our 14-episode season one, Abby meets a woman who will set her back on her heels in a way she's never been. There are ongoing threads in season one: Abby meets Danielle, and Abby supports her best pal Sara through a sudden breakup. In between, we learn more about Abby's troubled mother, and how Abby gets women to come home with her. What’s next for you? Any teasers on projects you’ve got in the works? I'm completing editing and sound design for Easy Abby season one, all of which will continue to be rolled out online by March. We will then repackage it as a feature film, so it can screen in festivals and theaters as well. And I'm crazy enough to be working on a season two arc for Easy Abby, plus working on the business end of getting sponsors for the show so we can continue producing it. Jamie and Jessie are Not Together is just now out on DVD, iTunes, Amazon and Google Play, so I'm up to my elbows promoting that. I really want Jamie and Jessie's love affair to be seen and enjoyed in 20 languages around the world. It's been translated into German, Italian, Spanish, and French so far. My next feature film is a suspense mystery set in a convent called, The Disappearance of Sister Pauline, and yes, it has a lesbian nun and a bisexual protagonist.